Exit Devices or Panic Bars, unlock doors opening to the outside, during emergency conditions. Exit devices are required by building code and local fire departments for many public buildings. Buildings will not pass inspection if they are not up to The Life Safety Code with door hardware. 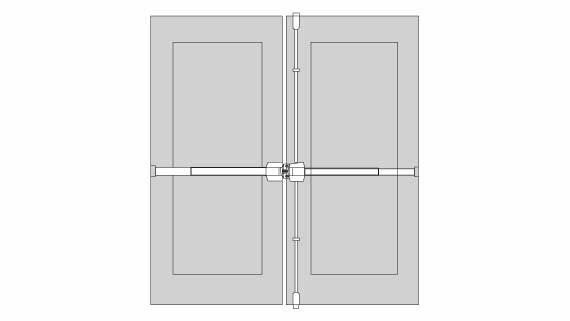 For single doors and double doors with a mullion. 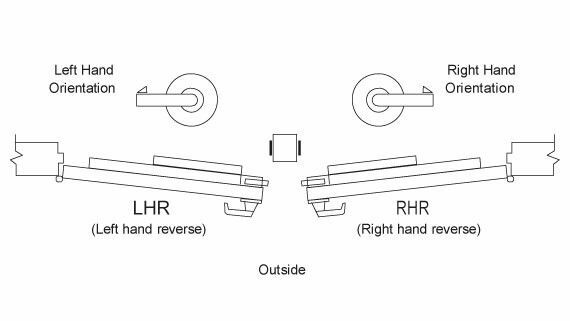 Rim Devices are non-handed and easily reversible; the latchbolt is completely enclosed in the latch case. UL Listed Fire-Rated devices available. 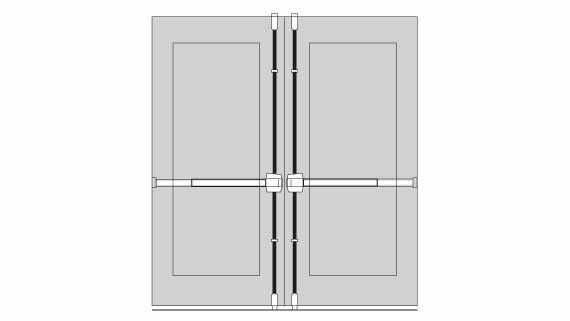 For single and double doors – Top and bottom latching rods are surfaced mounted on the door. Non-handed and easily reversible. UL Listed Fire-Rated devices available. Door used for exiting only, no entrance from outside. No outside trim. Open by pull and key. Key retracts latchbolt. Key locks or unlocks thumbpiece. Outside by pull only. Pull when dogged. Note: Trim designs vary, depending on device brand and model. Rim device or vertical rod device. Surface applied 2 point lock. 2 Rim Devices. 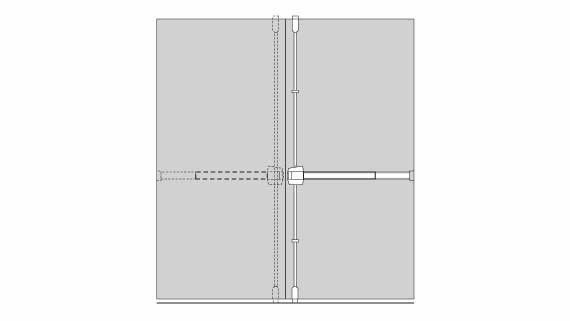 Two independent active doors with full double with mullion door openings when required. Same direction. 2 Vertical Rod Devices. Surface applied 2 point locking both doors. 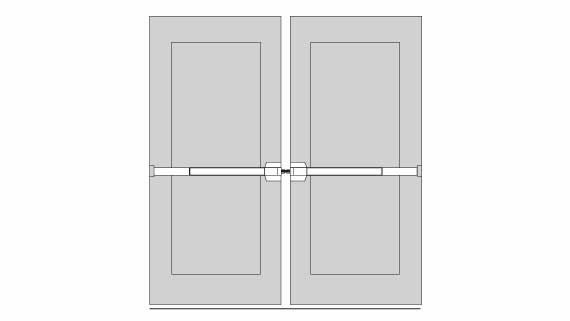 Each door rod type active same direction. Do not use with overlapping astragal. 1 Vertical Rod Device / 1 Rim Device. Both devices are surface applied. A coordinator and 1 rim type and overlapping strike is recommended. 2 Vertical Rod Devices. Double egress surface applied. 2 point locking both doors opposite directions. 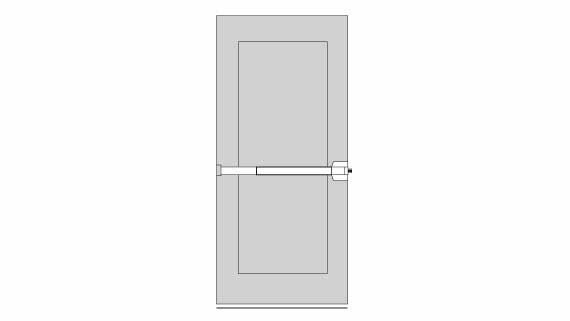 Door Hand is always determined from the outside or the key side..
A removable mullion (or post) enables rim devices to be used for two independent active doors. The ability to use rim devices is not only cost effective, but keeps maintenance to a minimum, as vertical rod devices often need adjusting over time. The mullion can easily be temporarily removed, enabling more clearance when moving equipment or furniture in-and-out of a room.